As a result, airports that aren't taking steps to update-or even develop-succession plans and employee development programs are finding it more difficult to hire managers and executives equipped to handle the rapidly changing business and technology dynamics they will encounter. Wayne County Airport Authority, which oversees the operation of Detroit Metropolitan Airport (DTW) and Willow Run Airport in nearby Ypsilanti, is one of many organizations facing the new challenge. "At our airport, a lot of our people have extensive experience, which is a good thing in terms of retaining institutional knowledge," explains Rodney Williams, director of talent acquisition and inclusion. "But the downside is we don't have as many staff members with an outside perspective from other industries and cultures. So when we're looking for people with more business acumen and management and leadership skills, we sometimes have to go outside to fill some of our key upper-level positions." A similar situation is unfolding at Reno-Tahoe International Airport (RNO), reports Dan Bartholomew, manager of planning and environmental services for the Reno-Tahoe Airport Authority. He also serves on the academic relations committee of the American Association of Airport Executives (AAAE). "We've had some difficulty hiring for planning positions-finding the right mix of backgrounds and experience," Bartholomew notes. "If you look at the airport world in general, things are accelerating from a technical standpoint so much faster than before. So in terms of background and experience, there's been a shift from what was needed in the past and what is needed in the future." Aviation Career Services, a national recruiting and talent development firm, highlights the need for active succession planning. Although the industry as a whole has emphasized development of succession plans, they often aren't implemented due to lack of time and funding, says Eric Mercado, the firm's chief executive officer. "There are at least two major East Coast airports that have had vacancies for six to nine months for executive-level positions," reports Mercado, illustrating the depth of the problem. The primary reasons: lack of proven leadership, technology and business/revenue-development skills-all traits that industry observers say next-generation airport executives will require to succeed. Diversity and inclusion issues also figure into the scenarios, he adds. A survey that RNO's Bartholomew conducted last summer for the National Airports Conference supports that assertion. Questions focused on the desired background and experience for airport directors and other senior positions. Generally speaking, respondents indicated that they want job candidates with master's degrees in business administration and finance or planning; flight experience (either current or former pilot licenses); AAAE certifications-Accredited Airport Executive (A.A.E.) for top spots and Certified Membership (C.M.) elsewhere in the management ranks; superior people skills; political astuteness; and experience at multiple airports. "That last one reinforces a saying in the industry: 'You've seen one airport, you've seen one airport,'" Bartholomew wryly comments. Questions were posed to 100 attendees, with 77 responding, yielding a statistically significant response, he notes. Previously, the typical route to an executive position included a military background and/or rising through the ranks of operations and maintenance departments. A bachelor's degree may or may not have been required. Now, a bachelor's degree is the minimum requirement, and master's degrees with a business emphasis are becoming the new gold standard, says Mercado. Moreover, promotions typically were dictated by seniority. "Everybody feels like they're next in line (for promotion to senior positions) because they're been at an airport for so long," Williams says. "And in the past, if you were next up in line, typically you were a good fit for the job. But now, the people who are next in line are aging as well; plus millennials usually aren't interested in 10- or 15-year runs." At conferences, Williams often asks colleagues how the industry can attract more millennials to ensure that there are enough future leaders. "We're just starting to feel this pinch," he says. "But 10 or 15 years down the road-if not earlier-we're really going to feel it." "As a whole, the industry is requiring a proven track record of success, particularly in business, revenue and property development and air service development and finance," Mercado adds. "The most direct path to a C suite these days is through the business and finance realm." Why the paradigm shift? Rising expenses, which prompt a need for more creative ways to raise revenue, play a key role. So do customer expectations for a more sophisticated airport experience that includes interactive wayfinding displays, ready access to technology and an array of restaurants, shops and even high-end lodging options. "Airports have changed from a government-type model to a business model," Bartholomew points out. "So for executives, we're looking at a shift to more education and diversified backgrounds. The industry is moving away from an actual degree in aviation to a degree that has nothing to do with aviation. "Instead, they want a degree in a related field, such as engineering, finance, planning and so forth," he continues. "The shift makes sense because airports need to be financially viable, are utilizing more technology and need experienced planners that can view airports comprehensively. Moreover, airports are expanding, and engineers build things...so it makes sense why these criteria pop out." Airport officials are also trying to get a better handle on creating non-aeronautical revenue, Williams adds. "If you're not going to get all your revenue from airlines anymore, then airports have to assume more of a business mindset and rely on business acumen. More and more airports now want to be a destination...when passengers arrive, they want to eat a decent meal and do a little shopping. Ten years ago, you were lucky to get a hot dog and a cup of coffee. Now it's hard to find an airport without, say, a Starbucks or several good casual dining options." Reasons vary for the disparity between what's needed from future executives and the credentials most current candidates possess. Mercado says that in many instances, individual airports haven't had enough money to invest in employee development. "To have active succession planning requires staff training. And with training comes dollars," he explains. To help keep leadership development costs down, he recommends ACS, which offers aviation leadership education in various regions. "It cuts down on the travel dollars and time away, which adds up," he notes. Others point the finger at universities-private institutions dedicated solely to aviation education and public colleges that offer aviation as one of many degree options. There's a disconnect between what they teach and the skills required by next-generation leaders, Bartholomew explains. "There's a need to break down that barrier-bridge that disconnect between the academic world and the world we work in," he continues. "How we do that is the million-dollar question...change in the academic world is not easy. But I hope it starts with things like our survey." In the meantime, airports like RNO are taking matters into their own hands by emphasizing professional development and succession planning. Because the airport is in a constrained labor market, two options exist for attracting quality employees: "buy" them from outside the organization or grow them internally, says Brian Moore, the airport's vice president of human resources. RNO opted for the latter approach by implementing a succession planning program designed to give the airport more control over workforce planning. There is risk involved, Moore acknowledges: High-potential employees can always leave to take other jobs, negating the investment of time and money in career development. "But if you're doing things internally to grow your talent and have those kinds of departures, you still have a greater ability to be more nimble and anticipate those departures, and less opportunities for vacancies and talent voids," he explains. "And if we don't provide some clarity regarding career opportunities, as we do in our very transparent succession planning program, they'll look for those opportunities elsewhere anyway. Plus, what if we don't train employees and they stay?" The succession planning program at RNO places a strong emphasis on education, through internal training programs and AAAE certifications. To that end, the airport more than doubled its tuition reimbursement budget during the last three years, to $35,000 from $15,000. All 265 employees-including 11 senior managers and 47 middle managers-are eligible to participate in the program. "It percolates all the way down to the janitors," Moore says. Educational programs span everything from career development to resume writing and interviewing skills. Requiring all employees to formally apply and interview for new positions helps eliminate feelings of entitlement to promotions, he notes. The renewed emphasis on succession planning seems to be working. Three years ago, employee turnover was about 12%. Now, it's about 9%. "They're staying because we're better at defining opportunities for them," Moore explains. The airport also has accelerated its hiring cycle. Three to four years ago, it took RNO about 130 days to fill positions. Now, it takes an average of 56 days. "Imagine what that does for employees in terms of work/life balance and continuity of workflow," Moore points out. "If it takes 130 days to hire a new employee, all those duties fall on the shoulders of the people left behind who already have full plates. Then they get burned out and frustrated." Moreover, the airport is filling roughly half its vacant positions from within. Three years ago, that figure stood at 19%. Moore says 75% internal hiring would be even better, but anything higher than that could be detrimental, because it's healthy to hire some employees from the outside to inject new points of view into the organization. As many U.S. airports grapple with filling vacancies in their executive suites, Van Nuys Airport (VNY) in Los Angeles continues to help fill the other end of the pipeline. For 12 years running, the airport has hosted an annual career day for local students. This year's event, titled The Sky's the Limit, included more than 1,200 high school students from the Los Angeles Unified School District. 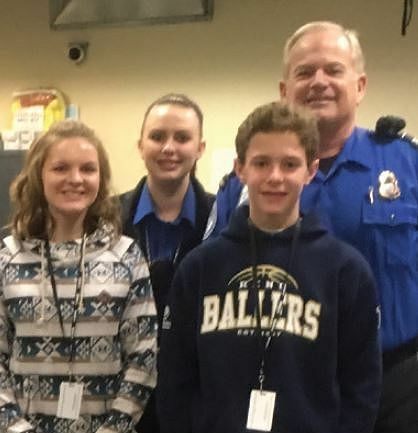 Students took a behind-the-scene tour of the airport, browsed through interactive exhibits, viewed aircraft and met with personnel from the Los Angeles Fire Department Air Rescue Unit and the airport's police and operations departments. The airport hosted the career day in conjunction with Nury Martinez, a Los Angeles city councilwoman, and Clay Lacy Aviation, an aircraft management and private charter company based at VNY. Major sponsors included Western Jet Aviation, a Gulfstream maintenance support firm, and Signature Flight Support, the field's fixed-base operator. This year, VNY supplemented its usual curriculum with a panel discussion to share the personal experiences of professionals throughout the industry. Led by Curt Castagna, president and chief executive officer of Aeroplex/Aerolease Group, the panel included: Joe Barber, director of business development at Clay Lacy Aviation; Samantha Butero, sales director at Tronair; Christian Moreno, VNY's chief of Airport Operations; Niall Mulcahy, station manager for Signature Flight; Chris Nielsen, a pilot at Avalon Capital Group; Jason Price, owner of Mach 1 Aviation flight school; and Tony Russo, manager of Duncan Aviation. "This event shows students the vast number of career opportunities in the field of aviation," says Jeffery Daar, commissioner of Los Angeles World Airports, which owns and operates VNY and Los Angeles International Airport. About seven years ago, DTW established a talent-management/succession-planning program aimed at "high-potential employees." The curriculum includes career development training and exposure to other jobs via job shadowing-help that employees need to take that next step in their career, Williams explains. "We're very systematic about it," he says. "We basically develop employee profiles that identify their backgrounds, skills, training required or taken and career development plans-road maps that show them how to get from where they are to where they want to go. We note what skills they lack to get there...it may be as simple as training to use Excel spreadsheets or as complex as developing negotiating skills." That said, Williams acknowledges that not every employee wants to move up the corporate ladder. He also recognizes that no matter how much the airport tries, some high-potential employees will leave for what they perceive as better opportunities. "The [era] of 30 years of employment and then getting a gold watch when you retire are gone," he says. "If we can keep someone for five to seven years, that's going to be considered good." On a broader level, Williams says that airports need to do a better job of branding to attract young employees. He consequently encourages industry peers to show them how exciting it can be to work at an airport. Too many young people think that the only jobs available at airports are being a pilot, baggage handler or TSA officer, he observes. What they need to know is that airports are like small cities that require everything from engineers, firefighters, police and operations people to maintenance workers, electricians, carpenters and plumbers. "Unless they get an aviation degree, most kids wouldn't know that we hire civil engineers at airports," Williams says. "And the other piece is that parents don't know, either. So a lot of it boils down to just more exposure to and education about how airports work. We have to be more proactive about branding airports." Toward that end, Williams often visits high schools and college campuses to raise awareness about airport careers. The airport also periodically hires interns. Recently, it hired five students from a local aerospace and technology high school for eight-week internships. DTW also has hired 15 college students for part-time, 13-week internships in a wide variety of areas, ranging from public relations, public safety and maintenance to operations, finance and procurement. "They get assigned a primary role and then rotate to other roles as well," Williams explains. "It's a pretty robust program." But is that enough to turn the succession planning tide at DTW? "It's a good start," he says. "Time will tell, but in terms of exposure and trying to get kids to understand what we do here at the airport, it's a huge shot in the arm. You have to be proactive-get out on college campuses and develop partnerships, anything to get young people engaged in an airport environment."